Friends of 1st Crowborough is a mixture of parent volunteers and leaders whose aim is to raise funds for the group. 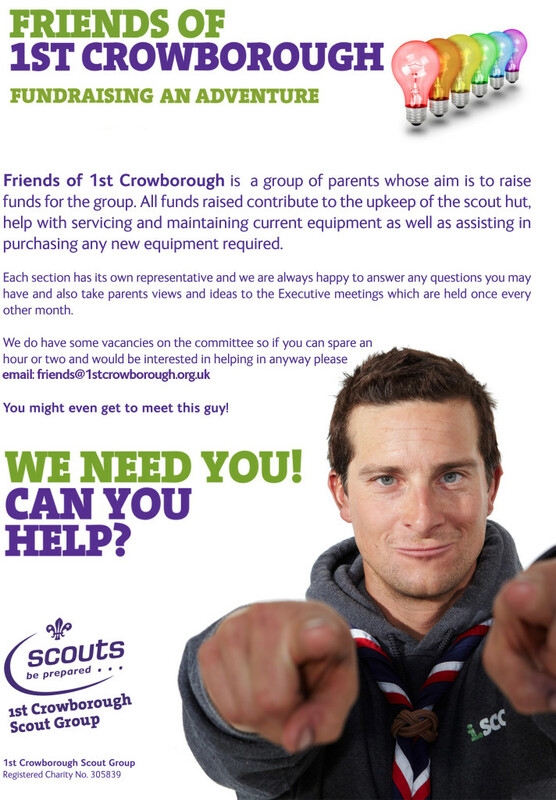 1st Crowborough is a large Scout Group, in fact, one of the biggest in the country. We are also fortunate to own our Headquarters on Whitehill Road – however, because we own it – we need to maintain it. A large proportion of the subscriptions each section charge goes to maintaining this building. Fundraising is an important part of the Groups income and allows us to make improvements to the HQ without having a direct effect on this termly subscription. This new Committee of people will predominately consists of parents of our members, ideally at least 1 representative from each of our sections. A member of the Group leadership team will also sit on this Committee in an advisory capacity. It would be great if some members of this Committee also attended our Executive Committee. All funds raised contribute to the upkeep of the Scout HQ, help with servicing and maintaining current equipment as well as assisting in purchasing any new equipment required. Scouting has been part of this community since 1908. Its a heritage to be proud of. If you have a great fundraising brain, and want to put it to good use, get in touch! WE NEED YOU!